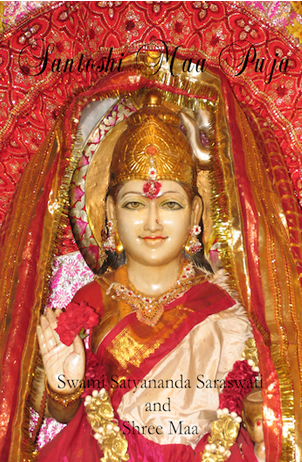 Santoshi Maa is the Goddess of Satisfaction, Contentment, Peace,and Acceptance. Her worship inspires these qualities within devotees. This Puja contains Her Dhyanam, Nyasa, the offering of items used in Her worship, and Her One Hundred Eight Names. It is offered in Sanskrit, Bengali, and Roman, with an English translation. Everyone is invited to join in the worship of the Goddess of Satisfaction. Santoshi Maa is full of delight! May She grant Peace and Satisfaction to all devotees who perform Her worship.